When was the last time you felt anxious? Playing Dark Souls, maybe? Being told you need to clean congealed bright orange sauce off a rental apartment wall the day after it was flung there during a feeding frenzy? If you answered yes to either of these questions and found even a little enjoyment from either activity, you may be interested in the challenge MEATliquor and Bandai Namco Entertainment are serving up in April. 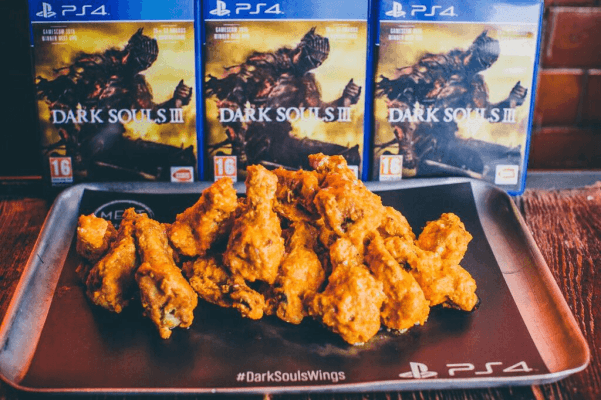 From the 4th to the 29th of April, brave UK gamers and chicken enthusiasts alike will be invited to take on the Dark Souls Wings Challenge. Should you choose to take on this throat-scarring, tongue-charring challenge, you will be required to eat twenty wings in the fastest time possible under super extreme pressure. 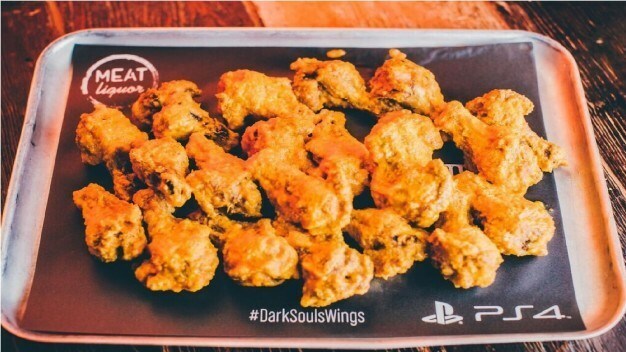 I don’t think I need to tell you how extreme stress connects this poultry-based challenge to the Dark Souls games. If you manage to complete the challenge, you will be rewarded with an exclusive “I SURVIVED the Dark Souls Wings Challenge” T-Shirt and be included in the Hall of Souls leaderboard for each restaurant. The winner with the fastest time from each restaurant will receive a Playstation 4 console with the Dark Souls III Collector’s Edition, while the…Soul survivor with the fastest time in the country will get one of those swanky sold-out Prestige editions I mentioned in another article. This is the edition that comes with the enormous 40cm Lord of Cinder figurine, which will be a perfect accompaniment to your smouldering tongue post-challenge, should you win. I love wings. I really do. I wish I was in London right now – hell, I wish I was in London most days. If you’re in London and can hold your own against angry, angry spice demons dancing over your tongue, then go in there and win that Prestige edition on my behalf! Focus your mind on the eternal flame and get into MEATliquor while the challenge is on! PS. For those wondering, I did manage to get most of the hot sauce off the wall. Let’s just say that was the one time I was happy we had yellow walls.